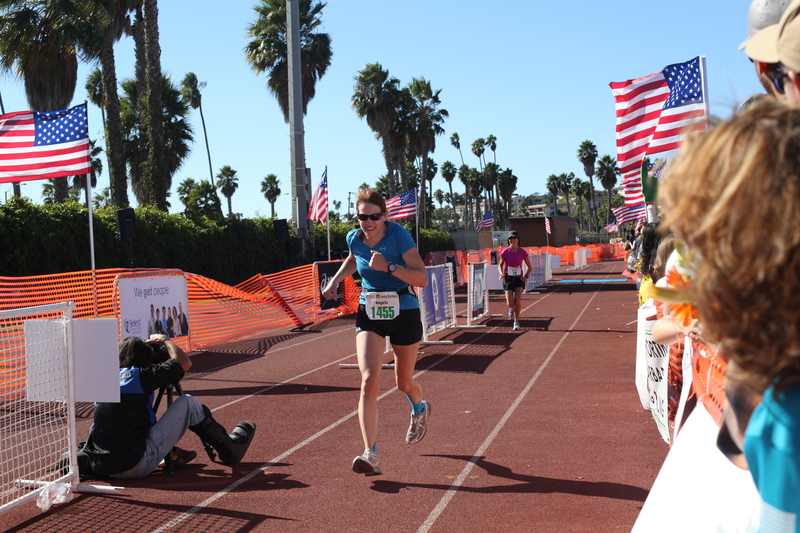 I am still processing what an amazing morning I had racing the Santa Barbara International Marathon, but I’ll do my best to put it into words (and pictures!) In retrospect, there are four things that made my first marathon go well: (1) the beautiful setting for a small(er) race, (2) a carefully planned fueling strategy for before and during the race, (3) proper pacing, and (4) the supportive people of Goleta and Santa Barbara who came out to cheer along the course. I paid attention to my carbohydrate intake about three days before the race. There’s lots of debate about whether carbo-loading is helpful, especially for women, but I wasn’t taking any chances after hitting the wall on my 20-mile training run. The day before the race I tried not to eat too much fiber, got a little extra salt, and had a carbohydrate-rich dinner with some lean protein (pasta with marinara sauce and chicken). In spite of my race jitters I managed to get about six hours of sleep, one of the best night’s sleep I’ve ever gotten before a race. I woke up at 4:15, about half an hour before my alarm was set to go off, and just continued to rest until it was time to get up. At 4:45 I got up and flipped the switch on the hotel teapot for hot water for coffee and oatmeal. I realized I hadn’t packed a spoon (oops) and was about to eat my oatmeal with the clean end of my toothbrush as a scooper (true story) but then I remembered I was staying at a nice hotel that probably had a spoon for the mini bar (it did). I ate 3/4 of a banana and a cup of oatmeal, timed to precision about two and a half hours before the scheduled 7:30 race start (I say scheduled because there ended up being a 15-minute delay). Two hours before the race I drank 3 cups of water. Half an hour before the race I drank two more cups of water and took a Green Apple PowerGel for the extra calories and tiny bit of caffeine. I planned to take in a little less than four 23.6-ounce bottles of Fluid electrolyte drink on the course, based on the calorie calculations I made with the instructions from 4 Steps to Perfect Marathon Fueling. My husband and kids woke up at 5:45 to take me to the race start. We left the hotel in Santa Barbara at 6:15 and arrived at the race drop-off location at 6:30, plenty of time to walk a few blocks to Dos Pueblos High School for the start of the race. On the drive over, a beautiful white egret flew over the road. Long-time readers might remember that on my training runs I often saw egrets along the Santa Ana River Trail, and right before my first half marathon an egret flew off the roof of my house. I love good omens! At about 7 a.m. the race organizers announced a 15-minute delay (I never heard why there was a delay but people posted on Facebook that the shuttles from the remote parking area were backed up with long lines of people). I texted my husband about the delay, and loaned my phone to two other women so they could make calls to their husbands. We all sat around in the warm high school gym until the announcer said it was time to head to the start. I dropped my bag off at gear-drop and took my place just before the 4:00 pacer. I gave silent thanks for the gorgeous race weather. High 40s to low 50s, sunny and clear. The forecast had threatened a 20-30% chance of rain and while I don’t mind running in the rain, I do mind RACING in the rain. There were high winds at times on the course but generally it was a tailwind and I never felt I was fighting the wind. The starting horn sounded and everyone took off in an orderly manner. Love, love, love a smaller race (1,375 full marathoners). 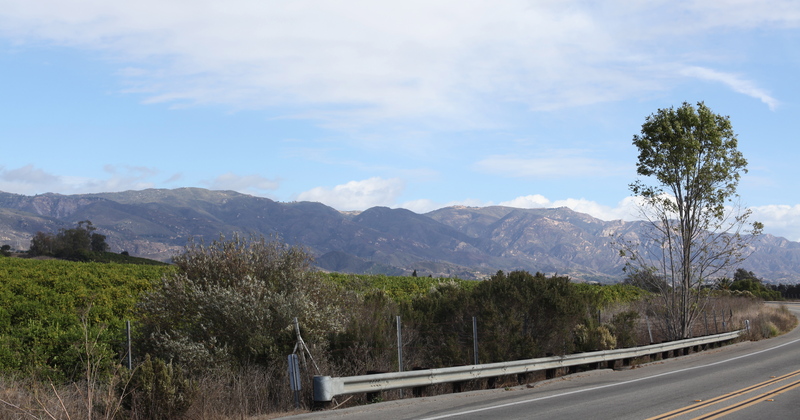 Goleta is beautiful with an interesting mix of mountain and ocean feel. I restrained myself from going out at too fast a pace. I kept it at 9:06, my marathon goal pace, only going faster on the downhills. I think that was the main thing that allowed me to enjoy this race from start to finish. When I did the half marathon, I’d burned out by mile 5 and questioned why I ever signed up for a half. That never happened to me over the course of 26.2 miles. The main feeling I had over the first five miles or so was: “I am so lucky to be here.” Cheesy as it sounds, I was grateful to be well enough to run the race, and to get to run in a spectacular new location. After training for six months, I was tired of running in the same old places, and here I was getting to run down the middle of the road along the coast on a gorgeous fall day. Mike and the girls met me around mile 6 to hand off a replacement bottle of Fluid. 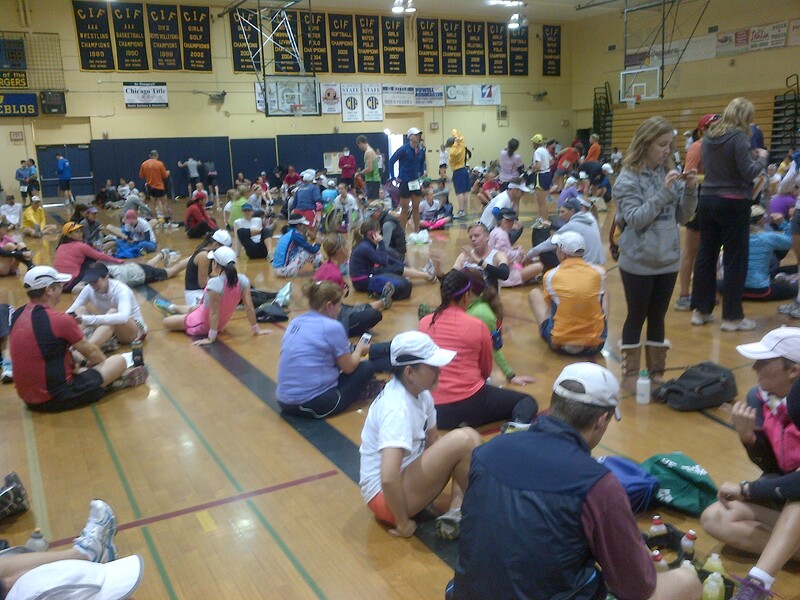 The course then wound through Isla Vista, back to the high school, to the mile 10 mark. Another runner asked what time I had on my Garmin and when I replied 1:31 he checked his pace chart and said we were one minute ahead of a 4-hour pace. That was perfect as many of the official pacers for the race recommended banking some time in the first 13.1 to make up for the .4-mile hill at mile 23. Mike met me again at mile 12 with another 24-ounce bottle. My oldest daughter ran along the sidewalk next to me for a while and told me she loved me. Such a nice way to boost me along on the race! At the 13.1 halfway point my gun time was 1:59.32. I felt strong. This is a good time to talk about the course support from all the locals. I wish I could personally thank each person along the way who cheered for me and the other racers (while I didn’t have the voice to do that as I was running, I did give everyone a thumbs-up). The best was when people read my name from my race bib and cheered for me specifically. Each time I’d feel a little rush of energy, a renewed surge to keep me going. My favorite race sign showed a picture of eagle wings and said “Touch for Power.” You better believe I touched it, and totally felt the power! I also high-fived a clown (pretty sure I didn’t hallucinate that) and passed a giant yellow chicken. I also loved all the unofficial bands that set up camp along the course. Violins, banjos, drums. Loved and appreciated them all. My 10-year-old passed me the last Fluid replacement bottle at mile 18. By mile 21 I could no longer keep up with the 4:00 pacer but still felt good and set my mind to push to keep the pace under 9:30 except on the big hill at mile 23. At mile 22 my legs felt tired and to entertain myself, I started counting the number of people I passed (while ignoring the people who passed me ’cause who needs to focus on that!) By the end of the race I’d passed 101 runners! There was a nice long downhill at mile 22 and the hill at 23 was tough but totally doable. I took a Green Apple PowerGel (the only gel I took on the course), not so much for the calories but for the caffeine boost. That turned out to be a smart decision. It helped. I didn’t walk on the hill and just kept on chugging and before I knew it I was at the top and ready for 2.2 miles of gorgeous downhill that included an amazing oceanside mile. How’s that for an inspiring view for the last mile and a half?! 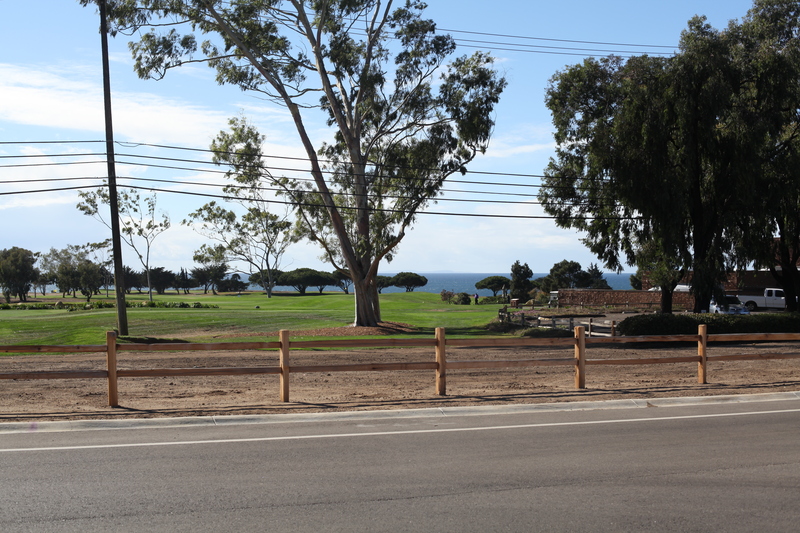 I thought that after the ocean views it might be a little anti-climactic to run to the finish on the track at Santa Barbara City College, but I actually loved hitting the track and sprinting to the finish. It helped that I finally passed that lady in the purple right at the finish! 😉 That never happens to me. I usually have no gas left in the tank at the end of a race. This time I felt fantastic and was just so thrilled to come in at 4:02:39.5. The McMillan Running Calculator had predicted that based on my half marathon time of 1:55:10, I could train to finish the marathon at 4:02:22. I was just 17.5 seconds off from that! Now that’s a darn good pace predictor, and a good indicator that I trained adequately for the race. Overall I was 511th of 1,375 marathoners (top 37%) and 31st out of 99 (top 31%) in my 40-44 age group (I’m 41). I surprised myself with how thoroughly I enjoyed my first marathon. I expected it to be like the half marathon, where I questioned why I ever wanted to put myself through that. Instead, I enjoyed the view, took energy from the fantastic people along the course, pushed through the last hard 4.2 miles, and finished with a huge smile on my face. Feeling strong and happy at the finish! Have you run a marathon before? What was your experience like? Are you training for a marathon now? Nice review this was my first marathon too. I was about over an hour behind you. It was a tough, but I was very happy to have finished. Congratulations on such a great time, I hope to one day be able to run a sub 5hr marathon. Congratulations to you on your first as well! Best of luck to you as you train for a sub-5! Awesome on all fronts Angela! Nicely done! Now I wish you luck finding balance between resting enough to heal and training enough to preserve sanity ( and some level of fitness ). Thanks Holly! I’m taking a week off from running and just sticking to walking for a couple of days, then I’ll try to get in some swimming and biking. The pool sounds heavenly right now! congratulations angela on becoming a MARATHONER! own it and savor it because its an amazing accomplishment. you just did what many people only dream about. 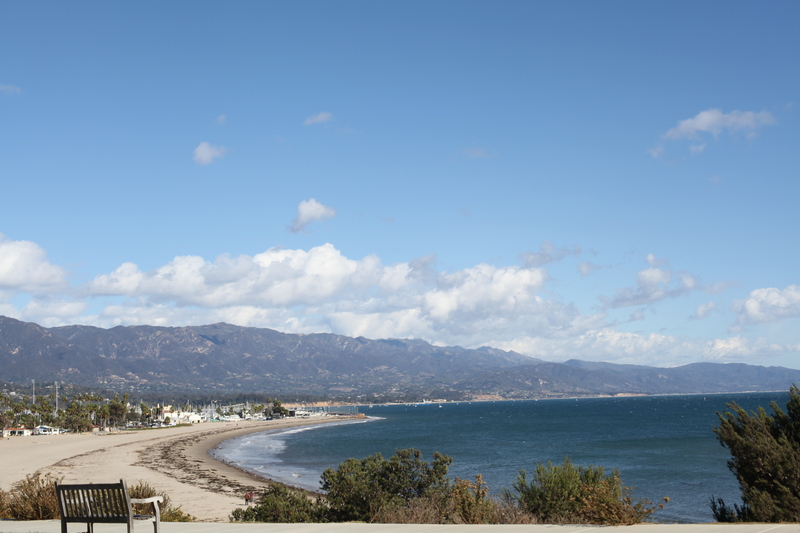 and i love LOVE santa barbara, isn’t it gorgeous? Thanks SR! I am still glowing from the experience! And yes, I absolutely love Santa Barbara and am ready to move here as soon as someone buys me a mansion and sets up a trust fund. 🙂 We made a nice long weekend of it and I am still here, sitting poolside, ready to head to the Botanic Gardens as soon as my husband gets back from a run. I’m new, here, but I had to comment on how similar your experience was to mine! First, Congratulations!! What a huge accomplishment. I was reading your recap and nodding the entire time. (not unlike a bobblehead) I just finished my 1st, too, and your words were like they could’ve come from my brain. I loved the course, and how different it was from my reg. routes. I loved how much better it felt than the 1/2s that I’d done. I, too, felt so BLESSED to be there, running that thing! Anyway…congrats, again. Can’t wait to read about your next adventure. Thanks for stopping in to comment! I enjoyed reading your recap of your first marathon as well. Opposite sides of the country but darn similar experiences! I’m glad your race was such a joy to you too. I found your blog as I was frantically looking for race recaps of the Santa Barbara Marathon and its elevation. I will run my first marathon on this course, on November 8th. I registered in March and checked everything. Believe me, I spent a LOT of time comparing marathons before signing up for my first one! I don’t really know why but I always assumed the course was pretty flat. I remember seeing an elevation chart but it wasn’t frightening as it was a long one (I mean, the miles were really spread). Anyway, I saw another elevation chart and now I AM SCARED. I didn’t check the recaps before as I didn’t want to spoil my first experience. I prefer not knowing too much and just discover by myself. But, the elevation chart on MapMyRun is scaring me. I didn’t really train for hills. I hope I still have time to make up for that. What did you think about the “rolling hills” and the big hill at the end? Was it difficult? Was it doable? Is the elevation manageable? Hi Marjolaine! Of the four full marathons I have done, Santa Barbara is my sentimental favorite. It was my first and I really enjoyed the whole experience, from getting to hang out in the high school before the race to finishing on the track of a local college. The rolling hills did not bother me at all (I think it’s good to mix up which muscles I use during a race). Now the big hill at the end, that is another beast. It didn’t bother me so much because I was simply running the race to finish. Had I cared more about my finish time I would not have been too happy to see that hill at mile 23-24. The good news though is that when you crest that hill, you get an amazing view and a speedy 2 miles downhill to the finish. What I did to train for it was to find a similar hill to run up toward the end of each of my long runs. You can do it! I hope you have as great a time running your first marathon there as I did! Hi ! Thank you so much for your reply. It is really nice of you 🙂 I will go check the course during the week end. It’s only a 45-50 min drive. I think it will be the best way for me to really know what I have to expect. I will now introduce a hill at the end of my long runs as you suggested. I know this hill won’t be a nice surprise at the end of the marathon, but, well, I’ll have to get on top! I am more scared about the rolling hills, actually. I don’t know if I have to worry about pacing me carefully because of them. Is it really hills or long slight uphill sections? I am fine with slight uphill sections. I am not so sure about occasional hills… I am certainly overthinking all of that! I really do not remember the hills being bad at all except the one. I think it’s a good idea to go drive the course (I did that and it was fun to take pictures for the blog later! ), just do not let the distance intimidate you!